The reason I really like Bit.ly though is that it has dynamically updated click-through stats. Since I have no control over traffic I link up through Twitter and other services I can see how many people have clicked on a link I have provided. I can also see which conversations have referenced it, something that's handy if you want to see how people are forwarding around something. 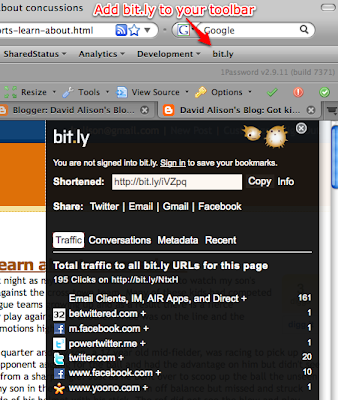 If you happen to hit a URL that has already been "bit.ly'd" then you'll see the click through stats on it as well. Needless to say services like Bit.ly are taking URL shortening to a completely different level. Got a URL shortening service you really like? Drop a note in the comments and share! And if you're not already doing it feel free to follow me on Twitter through DAlison. It's people like you that help to define and build our community. Thanks for the post on just the facts that you are liking what we are doing so far. Definitely feel free to chime in to us with suggestions, questions, etc. That is how we grow into the service you want! My loyalties lie with is.gd, tr.im and tinyarro.ws (the shortest URLs on earth). @Rex: I also just noticed the Info section and the hourly click through data; very cool. @Jeffrey: Yeah, that's an impressive 10 lines. BTW - you were the one that I first saw using Bit.ly which is why I tried it out. @Azhar: Is there a particular feature of these that you really like? Clearly is.gd and tr.im are even 1 char. shorter than Bit.ly. I'd never heard of tinyarro.ws before. The fact that it uses a Unicode characters to make "tiny" URLS is deceiving though; most will end up being expanded to ASCII standard characters and be considerably larger. I to use bit.ly, started as it is the default on TweetDeck, then just got in the habit. @Sam: I didn't realize .ly was Libya. Wonderful. Hopefully it will be a non-issue. I know I am totally in the minority on a site like this - where tech people talk to tech people. We believe that if something is good about technology, then the words and message should be understandable to everyone, not just those who know their stuff. We like TinyURL - but not for any tracking reason or shortened code reason. We like it because we interact with normal non-technical folks most of the time. Most non-technical folks would have trouble understanding what "bit.ly/14eny" or "cl.igs/bl6g" means. However, most folks can immediately see that "tinyurl.com/meermanthanks" and "tinyurl.com/reviewcopies" are probably about something to do with David Meerman Scott and thanks, and something about review copies. And, they understand intuitively that the link they are looking at has probably been made shorter. So, why does that matter? Well, if you are only going to interact with people who know the jargon and the tech stuff - then it doesn't matter. However, we think technical people have a responsibility to be clearer about the benefits of technology to those who don't yet get it. That means using the English language clearly, not using jargon at all, staying away from overly technical terms and writing to the audience that most needs it - not just to the tech in-crowd. So, we'll continue to put TinyURL on our Tweets, LinkedIN and Facebook pages for that reason. We're less interested in counting click coup than we are in communicating clearly. @Michael Benidt: Thanks for the comment Michael. Bit.ly can also create custom named URLs. For example you can access my blog through bit.ly/davidalison. I have to disagree about the impact of something like http://tinyurl.com/meermanthanks vs http://bit.ly/12tueW on non-technical people. A URL is simply an address, an id for locating something on the web. Does that make me a techie elitist? Perhaps. I believe that people click on links because they have a relationship with the person presenting them the information, not because the link looks "friendly". If I provide a link to people that follow my Twitter feed they will click on it because I describe why they should click on the link, which is where a very short URL comes in handy. If you want people to pass information around on Twitter, "re-tweeting" it to others, then leaving enough space for RTs from other people is a very good thing. The entire purpose of providing a link is to get people to click on it, whether you're trying to promote something or expose something interesting you've found. Understanding how many people are accessing the information you provide gives you a sense of how valuable it is to your network (social circle, audience, friends, etc). While you may view that as "click coup" I see it as a way of better understanding the audience I have.